$399.99 & FREE Shipping on orders over $59. This tried and true filter pumps fluid from one container, through three filter pads and back into another container. Designed for home winemakers who will be filtering more than 10 gallons at a time. Has a built in Flojet pump, which can be used to rack wine from one container to another by bypassing the filter pads. The pump is relatively small, drawing .5 amps and is standard 110V. Additional features include a carrying handle, built in pressure gauge, on/off switch and 4' power cord. The pressure gauge will tell you when you need to replace the pads. You will not want to filter wine which contains solids such as stems or oak chips. This will clog the pump and void the warranty. The manufacturer suggests that you wet the pads before inserting them into the filterhousing. Run a couple of gallons of water through the pads before you start filtering the wine. To help neutralize the pads you can use one to two teaspoons of Citric Acid in 2 gallons of water and run that through the filter. MoreWine suggests that a stock sanitzing solution of potassium metabisulphite and citric acid (1 tblsp each in a gallon of water) ran through the filter followed by a cold water rinse would be the best way to treat your pads prior to use. Ordered the Mini and it was NOT big enough. Box said only 5 gallons then let set for 45 min.. HAVE NO TIME FOR THAT.. I've been looking for a filter system like this for my 1bbl system, is there any reason why this jet filter could not be used to filter beer? BEST ANSWER: The Super Jet can be used to filter beer, as long as it has not been carbonated. Will any of your pumps filter 185 degree syrup. It is not thick at that temp. Wondering if the pump will take the heat? If I Change hoses and clamps do you think it would work? I would call the manufacturer, they are very helpful. BEST ANSWER: Hello - Depending on the model. One of these pumps should be a replacement. So far - so good. Mostly. Set-up and operation are simple enough. Everything was going smoothly on my first transfer/filter batch when suddenly the input line started spraying wine everywhere. The pressure gauge did not seem to indicate the filter pads needed changing (10psi), but it made a real mess, and we lost a few bottles worth of wine in the process. Changed the filter pads, and started again, but it sill seemed leaky around inlet. So, we will see what happens next batch. I would welcome any input on how to avoid such a mess in the future. Easily transfers 50gallons of wine in no time. Processed over 30 cases of wine using this filter and also used it without the pads to transfer 60 gallons of wine prior to filtering. 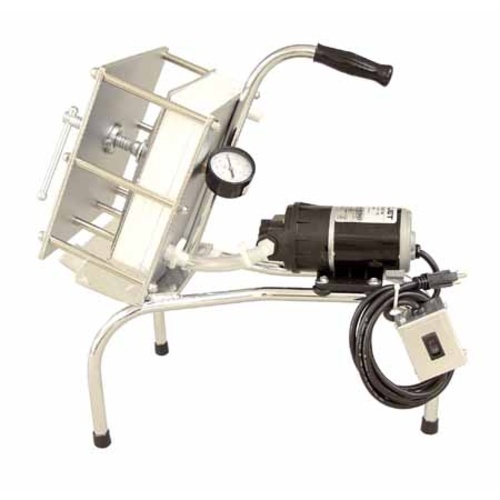 Pro: It's a great high-volume pump/filter combined unit. Use one to three pads of the same type for each pass. Backpressure gauge is a nice feature to let you know when to give up on your pad. Toss it and put in another! Pro: Generic pads are available to lower the operating cost. CON: It leaks. The drip tray is really a futile attempt to solve the problem. Get a cheap mortar mixing tub (or a litter pan) to put the unit in and all will be just fine. I run 15+ gallons at a time through mine (hard cider) and I'm happy.